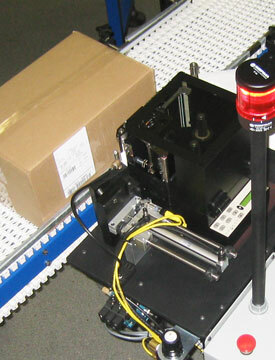 The CL3000 is controlled by a high speed PLC that communicates with the conveyor or other product handling equipment. The PLC’s control panel offers a 4-line display for quick set up and full diagnostic feedback. Barcode labels are printed using a Zebra® PAX print engine and are applied to cases by a heavy-duty tamp assembly. The spring- loaded tamp-pad adapts to the case surface, wiping the label on as the case passes. The CL3000 is built to handle the rigors of a 24/7 case labeling environment with a rugged PHD® slide-cylinder, heavy-duty stand, NEMA 12 UL listed industrial controls enclosure, and other high quality commercial parts.